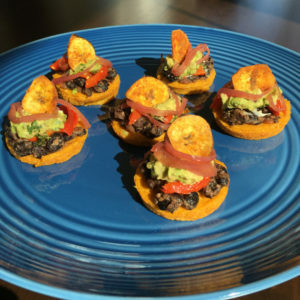 Just in time for Cinco De Mayo – not one, not two, but THREE incredibly flavorful vegetarian recipes from Kelly Jones, MS, RD, CSSD, LDN. Bring 2.5 cups water with 1 cup lentils to a boil, then reduce to a simmer with lid tilted for roughly 30 minutes, or until all water is absorbed. Stir on occasion so they do not stick to the pan, and add extra water, 1 tbsp at a time if needed. Heat oven to 425, using convection if you have that function. Add the carrot, jalapeno, and onion to a food processor and pulse until shredded. Add all other ingredients except for the garbanzo flour, including the lentils, and pulse until combined, but so that there is still some texture to the lentils. Pour mixture into a bowl and stir in the flour until well combined. The mixture will be wet, but should not be soupy. If it seems too wet, add 1 more tbsp of garbanzo flour. Scoop a level 1/2 Cup of mixture onto a baking sheet covered in parchment and sprayed lightly with cooking spray. Press lightly over top until you have about 1/4-1/3 inch thick. I fit 4 burgers per baking sheet. Bake for 15 minutes if on convection, 20 minutes if not. Remove from oven, and carefully flip over with a sturdy spatula. Bake an additional 7-10 minutes if on convection, and 15 if not. After prepping ingredients as indicated above, heat the oil over a medium-large skillet over low-medium heat. Add the onions, stir and cover 3-5 minutes. Add the carrots to the onions, stir and cover an additional 3 minutes. Pour in the tomatoes and lentils, stir and cover for at least 10 minutes (the longer you cook canned tomatoes, the less of a “metallic” taste you’ll have!). Add your taco seasoning, stir and let simmer for another 5 minutes. Add the spinach, stir, and turn off the heat. 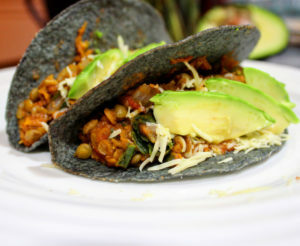 Get out your taco shells and toppings and serve! Add all ingredients to your slow cooker and stir. Set on high for 8 hours. Place the whole pepper(s) on a baking sheet and place in the oven for 30 to 40 minutes. Turn the pepper every 10 minutes and remove when skins are completely wrinkled and the pepper is charred. Remove from the oven and place peppers in a bowl, immediately covering with foil or the top of a cooking pan. Set aside for at least 10 minutes, or until the peppers are cool enough to touch. Remove the stem, peel and seeds. While the roasted red pepper is in the oven, prepare the plantain chips. I like this easy recipe. 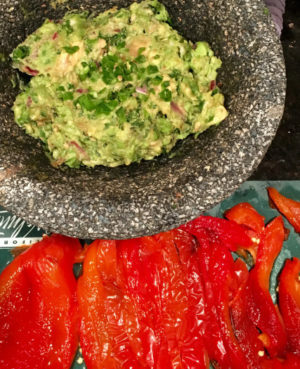 With both the red pepper and plantains in the oven, prepare the guacamole. The guacamole directions are here. Boil the vegetable broth in a medium pot. Slowly add the polenta while whisking. Reduce heat to low and continue whisking until polenta thickens. Cover the pot and continue to cook. Stir the polenta well every 5-10 minutes, scraping the sides. Cook for a total of 30-40 minutes. Stir in the olive oil and remove from heat. Spray desired pans with olive oil cooking spray. Pour the polenta evenly into two 12-cup muffin tins, two cake pans, or one of each. Let cool in the refrigerator for at least 20 minutes. While the polenta is cooking or cooling, quick pickle the onions. Add the vinegar, water, honey and thinly sliced onion to a small pot and stir. Bring to a boil, stir well, and then turn off the heat. Let sit until you assemble the dish. With a small rubber spatula, carefully remove the polenta from the muffin tins or, if in a cake pan, cut into six pieces and carefully remove and place on serving dish. Next, top the polenta with 1-2 tablespoons of the slow cooked beans. Add 1-2 pieces of roasted red pepper. Add 1 tablespoon guacamole and pickled red onion. Top with a polenta chip. Kelly Jones, MS, RD, CSSD, LDN, is a board-certified sports dietitian in the greater Philadelphia area. As a media spokesperson, speaker, consultant, and nutrition coach, her expertise lies in performance nutrition, fitness club programming, and intuitive eating. Kelly is the co-creator of the virtual course Fit Fueling: Mindful Eating for Active Females. Visit Kelly's blog for recipes, fitness nutrition tips, and more. Connect with Kelly on Twitter, Instagram, and Facebook.